I wore this to church yesterday morning after the temperature decided to drop 30 degrees in less than 12 hours. I walked out the door without my coat, immediately ran back into the house and grabbed the first one I spotted in our entry closet. Of course leopard, in my eyes, is always the print that outshines the rest, plus this is one of the warmest coats I own. I wasn't too sure about how well it would go with my scarf, but I ended up liking how the two patterns paired. Isn't it funny how we find new ways to coordinate accessories on a complete whim? Thank you, bipolar weather for this one. I thought I would show you guys a few shots with and without the jacket as my teeth chattered, hands went numb and hair flew in all sorts of directions. Speaking of sucking it up despite the frigid temps, I have to give major props to every person who photographs all of us crazy bloggers. Friends, husbands, boyfriends, parents, siblings, children and any others that I missed, you guys are rock stars! Speaking from my own experience, the people behind the lens are gifts from God. Ross was just a cold as I was and never once complained yesterday. He never does. He isn't taking these pictures for himself. He is doing it for me and because he knows how much it means. Honestly, if it weren't for him and his unselfish willingness and support, I wouldn't have a blog. I know many style bloggers set up a tripod and shoot their own photos, but I don't think I would ever have the patience to learn the tricks of taking self portraits with a remote or timer. So, high fives to all of you ladies who do it. If you do have a photographer(s), be sure to let them know how much you appreciate their help. I know I tell Ross thank you at least 10 times every time. 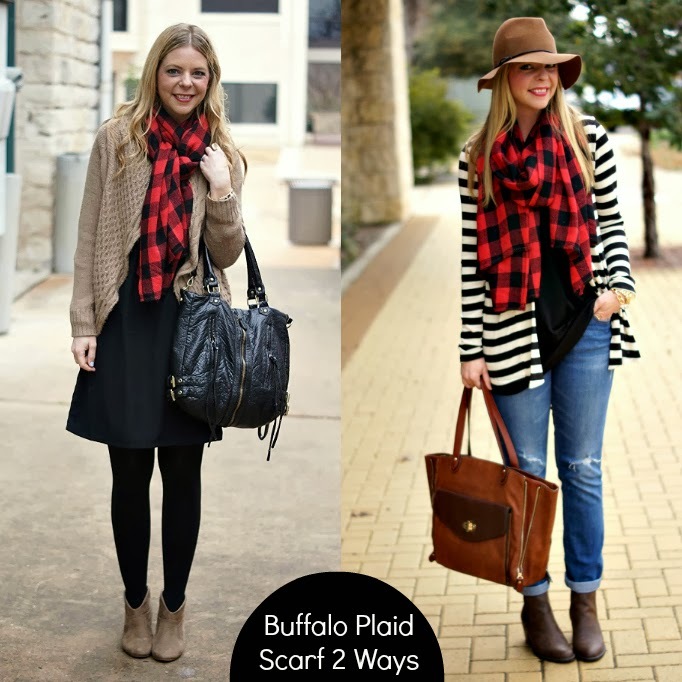 I am linking up with Lauren at Fizz and Frosting to show you two ways I wore this buffalo plaid scarf. It really has become one of my favorites this winter. The post with denim can be found here. I hope everyone enjoyed their weekend, ate way too much at a Super Bowl Party (I know I did) and are staying warm. P.S. We got to see Gus this weekend. He is a rock star and has come so far in just a few short weeks. Ross got to hunt behind him and it was amazing to watch them work as a team. Ross was smiling from ear to ear the whole time we were out in the field. We found out that Gus is graduating a week early and he is coming home in 17 more days!! It can't come soon enough! Did you just make plaid and leopard in the same outfit work?! That's pretty awesome! And yes, those bloggers are so lucky! I am still trying to figure out a way to make my husband take my photos and finally post outfit pictures! Haha! love the leopard!it one of my favorites! you look great! I love your coat...to bad you guys have been having such bad weather...I'm sure it will get warmer soon *I hope for you. Love the print mix, you look so cozy. Sending some warmth your way. Gorgeous Shan! Love the print mix! 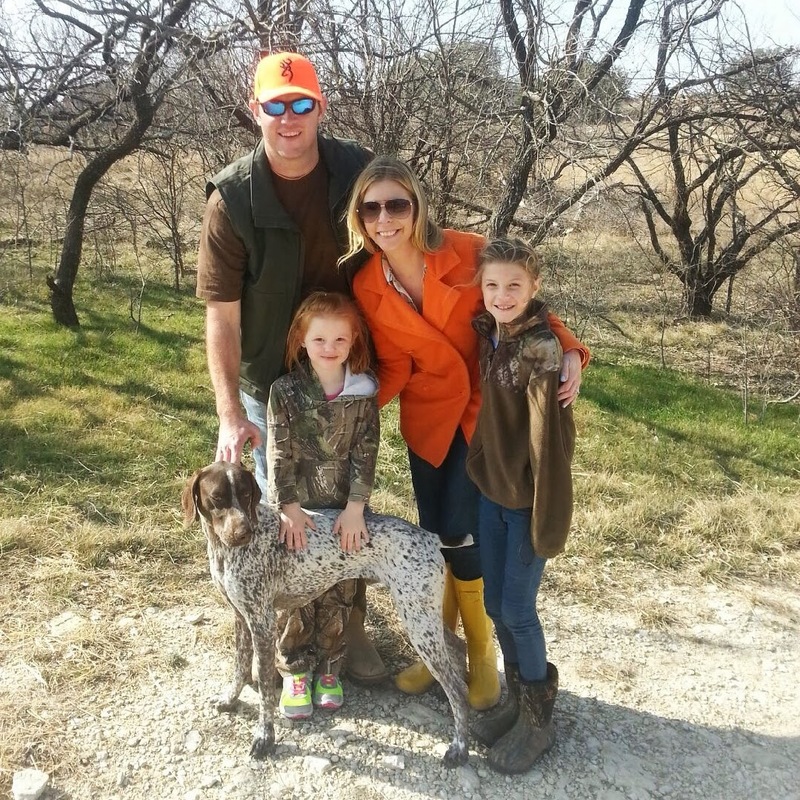 That picture of your whole fam is TOO CUTE! Love it! That is awesome he gets to come home sooner. He is adorable. Love the plaid & leopard! Cute look! What a cute combo. I'm in LOVE with that scarf! I LOVE that scarf Shanna! Glad you had a great weekend! Super cute, that looks great together. Your post is what inspire me to mix colors and prints. Love it all. Oh our sweet husbands. I know mine hasn't minded taking a break from pictures the past few months. What's UP with this crazy weather!? The leopard print worked perfectly! What a wonderful surprise! Also, any news on the whole fashion blogger rep for iHeartRadio? Happy Monday! love! and yay Gus!!! Too sweet. Love the leopard and plaid together!! Great outfit girl!!! I love the plaid and leopard together! Such a fabulous look!! I love the pattern mixing, here. And yes to the photographers! I am so thankful Tyler takes my pictures. I know sometimes it's the last thing he wants to do, but he does it anyways! (I normally make him take the pictures during the commercials of Sunday football haha). So thankful for him and all of the other blog support I have received! You look so very glam! :) And I am so over how frigid the weather is right now - time to warm it up, world! i love that Ross takes pics for you, what a great way to spend time together! I can't wait for y'all to get Gus back!! So cute! Love the coat and the bag is cute too! IDK how we bloggers do it - taking pics despite the blistery cold. Talk about dedication, lol! ;-) Stay warm and Happy Monday...XO! Great way to layer this cold season! I love the leopard print coat! Love this print mix, it is perfect! And your leopard coat is to die for! Love how you remixed the scarf in both outfits! So happy to hear your guy is coming home sooner! Ha. The weather is bipolar. Mostly polar here. 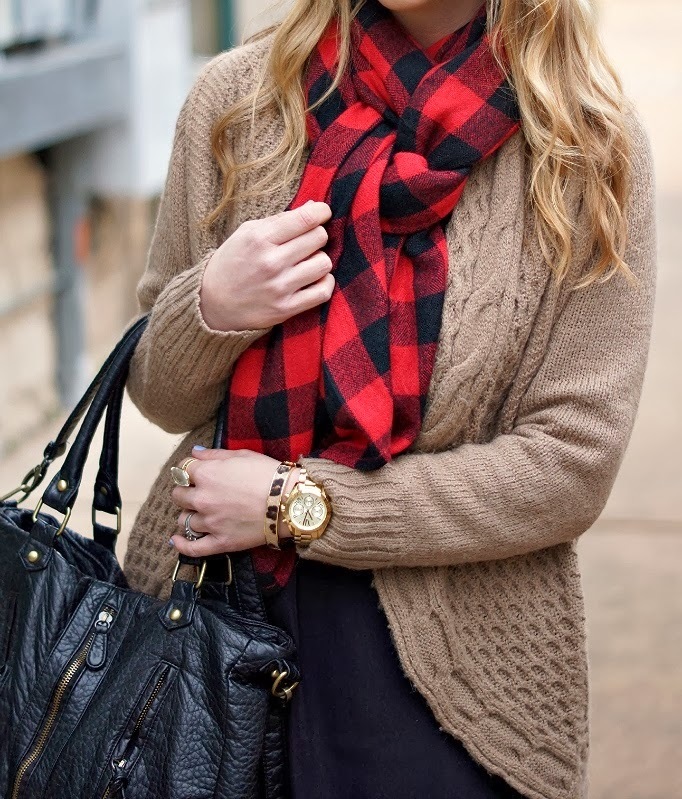 Love your buffalo plaid scarf and how you styled it. Loving the plaid and leopard mix! It's so pretty! I too am a fan of serendipitous outfit and color combinations! You would never expect this pattern to look good, but it looks great! I always feel bad for the person behind the camera, as it is always so cold! But I usually only take pictures on the warmer days (30). All I can say is I can not wait for summer! Loving this look on you, I would never have thought to mix the two patterns together and they look amazing. Be prepared to be copied;) I agree about our photographers, I take my own photos 90% of the time, but my husband is always game to help me on the weekends and scouts out locations for me as well. Without his support, this blog would never exist! You are always the cutest! Love both these looks! And yay for seeing Gus! I love when you just randomly out together an outfit and it turns out so cute. You rock that coat! Great layering Shanna! The scarf looks perfect with the leopard coat. Leopard is the new neutral and it does go with everything! I want your coat. And your scarf. Can I come play in your closet!? What a great guy Ross is!! My husband does nothing but complain when taking outfit photos! I love how the look turned out with the coat, and I love it without the coat too - it's perfect! The leopard coat surely can add character to any look Shanna...and yes I call our photographers our unsung heroes & I can't help admire those bloggers who take their own pictures....very talented ladies indeed!! oh my goodness, I love this whole look! And I have all the components to make it happen. WiN! This mix of plaid and cheetah with the pop of red is FABULOUS!!! Love the look!! !